Car is 1998 Volvo V70 with 106K miles. – Symptoms: sometimes cannot crank the engine, after wiggling the key a few times, then I can start the engine. It was intermittent, then it became permanent. – Key can turn to Position I and Position II but not Position III (crank). – Initially I thought it was the Ignition Switch (Electrical Portion to the LEFT of Steering Column), which was replaced but same symptoms! 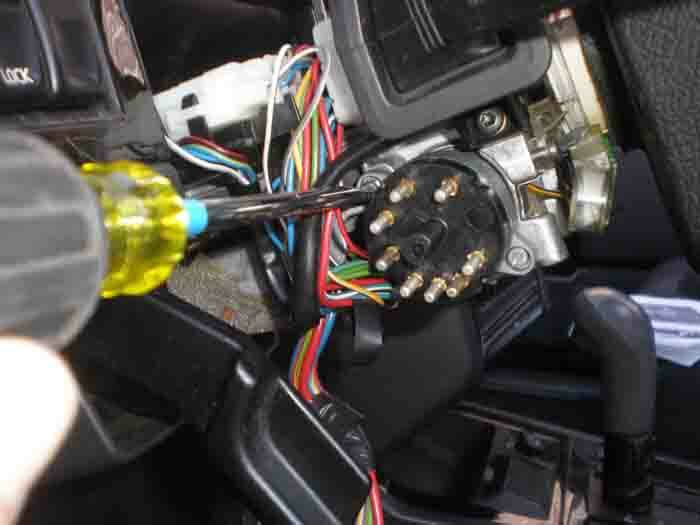 It turned out to be the Ignition Tumbler Lock (where you insert the key). 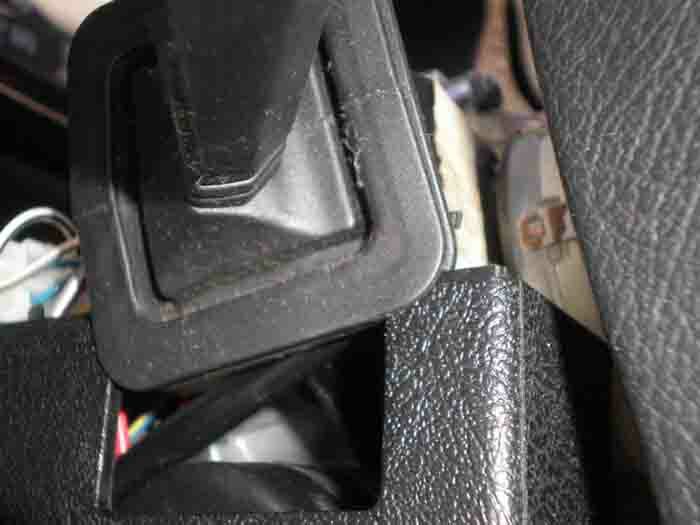 ATT: If you replace the Ignition Tumbler Lock (where you insert the key), there is NO need to remove the Steering Wheel at all! Read on. 1. Igntition Switch (Electrical Portion is PN 9447804, $50 at Volvo dealer. Do not use aftermarket part). FYI, 1998 and earlier models probably have no anti-theft chip in the key. 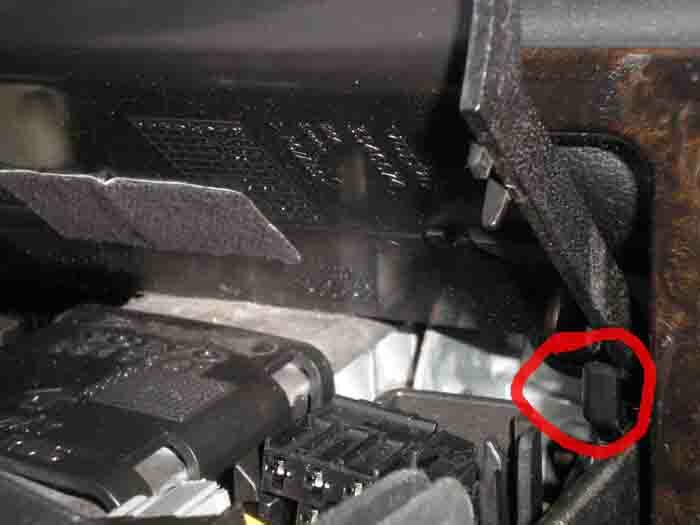 I connected the Ignition Switch (Electrical Part on the LEFT of Steering Column) to the connector and use a flat screwdriver (in the location labeled “Slot”) to crank and the car starts right up. 4. Shear Bolts are supplied with new Ignition Tumbler Lock Assembly. 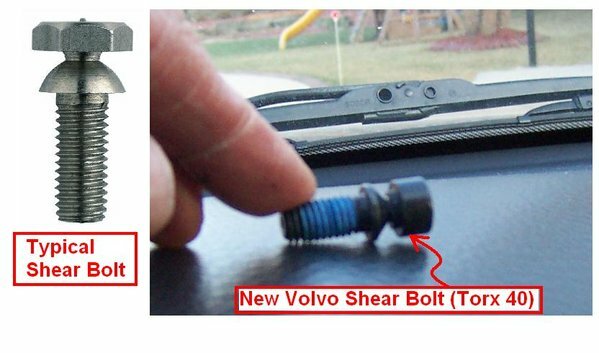 For those not familiar with Shear Bolts: these are used during assembly at factory, once the head on the Shear Bolt is tightened to a certain torque, the outer head snaps off, leaving a round inner head, making it difficult for thieves to remove. 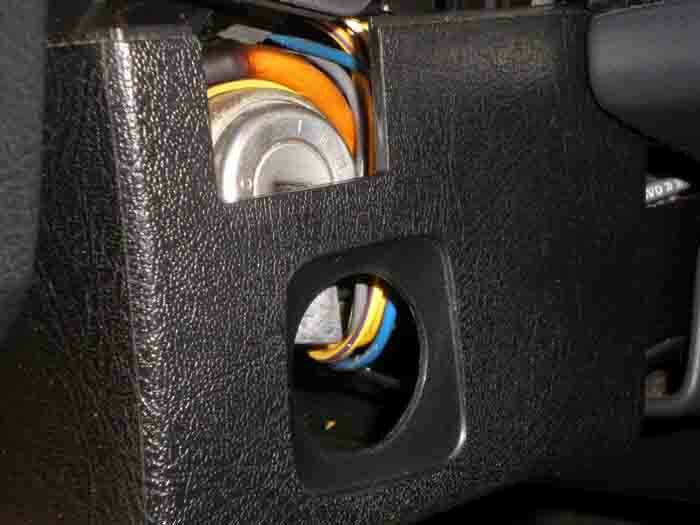 When you buy the Ignition Tumbler Lock Assembly, the Shear Bolts are supplied with it. – During re-installation, I simply tightened the Shear Bolts snug without snapping the head off just in case I want to remove them later. 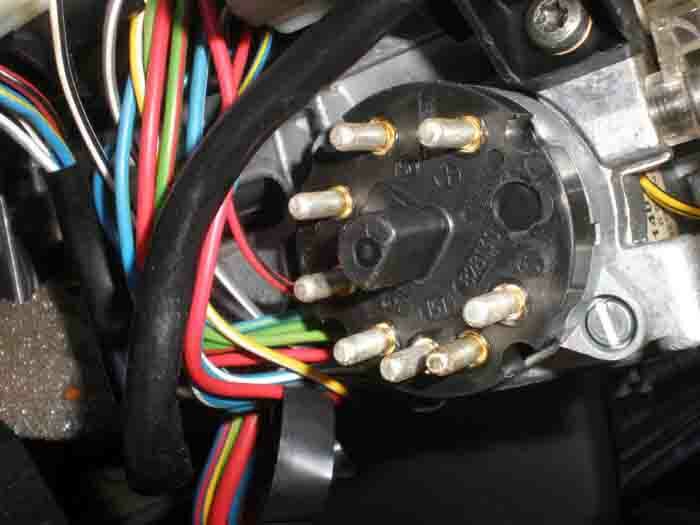 – The LEFT side of the Ignition Assembly is the Electrical Portion of the Ignition: it turns I, II and III (crank). 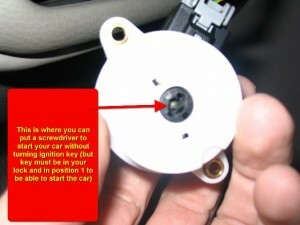 – The RIGHT side of the Ignition Assembly (where you insert the key) can only be turned with the proper key and has a cable to control so you cannot remove the key if the car is not in Park. The RIGHT side turns the LEFT side via a flat piece of steel, pretty much similar to your lock at home. 1. Disconnect Battery Ground Cable for safety reasons. 2. Use a flat screwdriver to lift off the rubber trim, then lift the Upper Cover close to SW upward (#1), then slide it toward you so it slides out of the hook (#2). The Lower Cover is secured by three (3) Torx #25 bolts. When removing the Lower Cover, pay attention to the part around the Lighted Ring: tug the Lower Cover outward a bit so it clears the Lighted Ring then remove it. 3. 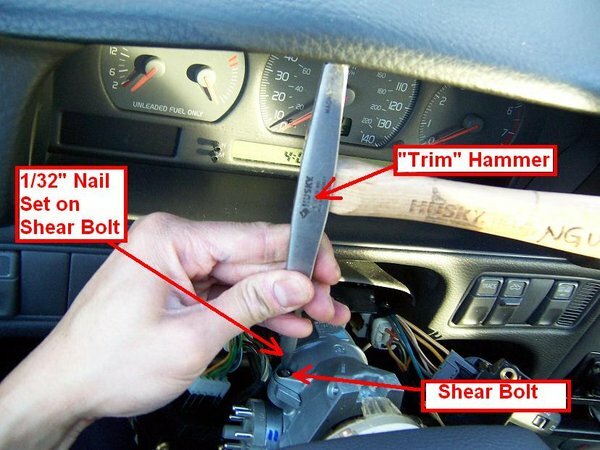 Remove Turn Signal Stalk and Wiper Stalk: Each Stalk is held by two (2) Torx #25 bolts. 4. 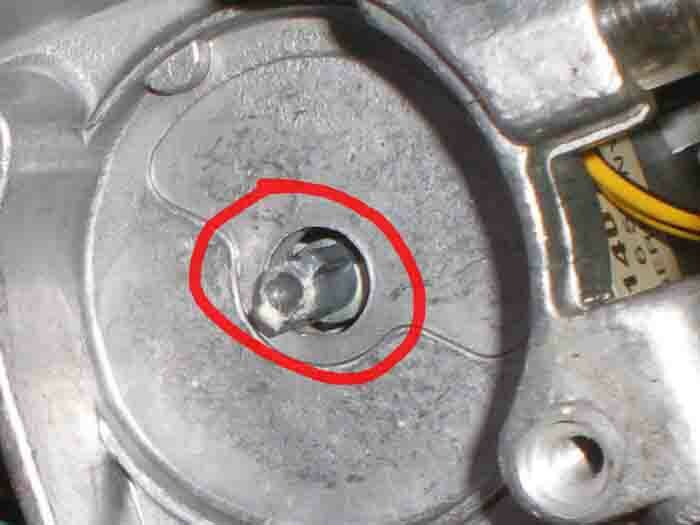 Now you can see the Shear Bolt round head. At factory, the force used to tighten the Shear Bolt was not much, so with the Nail Set you can “chisel” it out. Angle the Nail Set in such a way that it angles about 45 degrees and tap it with the “trim” Hammer Counter-Clockwise to remove the Shear Bolt. 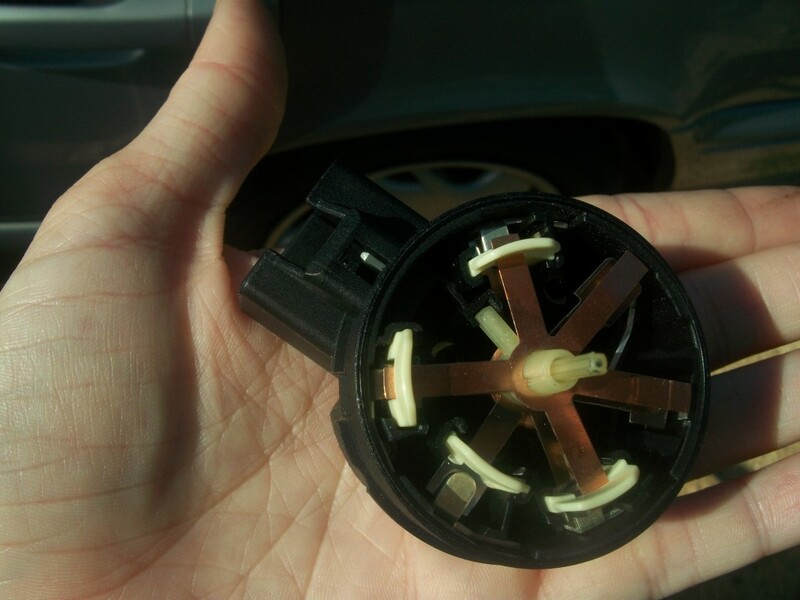 This is why you do NOT need to remove the Steering Wheel when replacing the Ignition Tumbler Lock Assembly. 5. 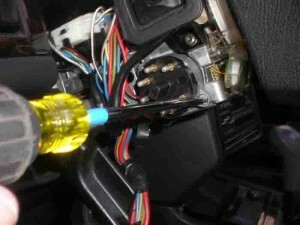 Use a flat screwdriver to gently disconnect the Connector to the Ignition Switch (left side of Steering Column). Disconnect the three Torx Bolts holding the Horn/Air Bag Ring (aka “Clockspring”). Once the Shear Bolts are removed, the Cylinder Lock Assembly will fall down, so support it with your knees. 6. Now disconnect the Lighted Ring connector then remove the Lighted Ring from the Assembly. 7. 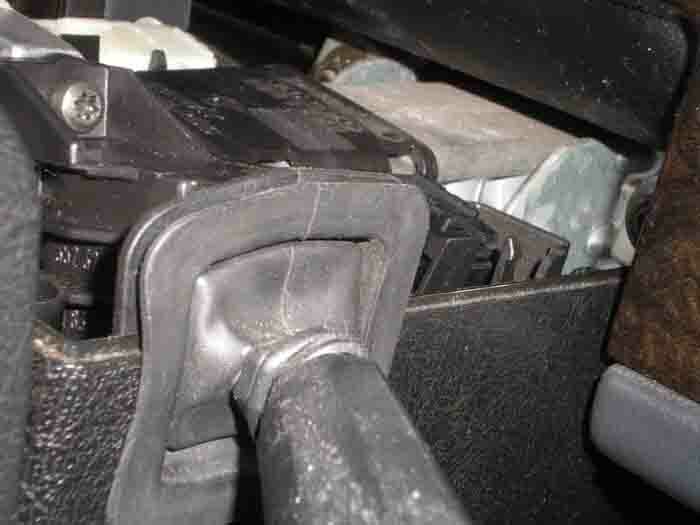 To remove the Parking Release Cable: squeeze both sides of the tabs and use a flat screwdriver to gently pry it out. But first use a Sharpie to mark the depth of insertion of this Parking Release Cable so you know how much to insert it to the new Assembly. I think the key needs to be in position II to insert this Parking Release Cable. 8. 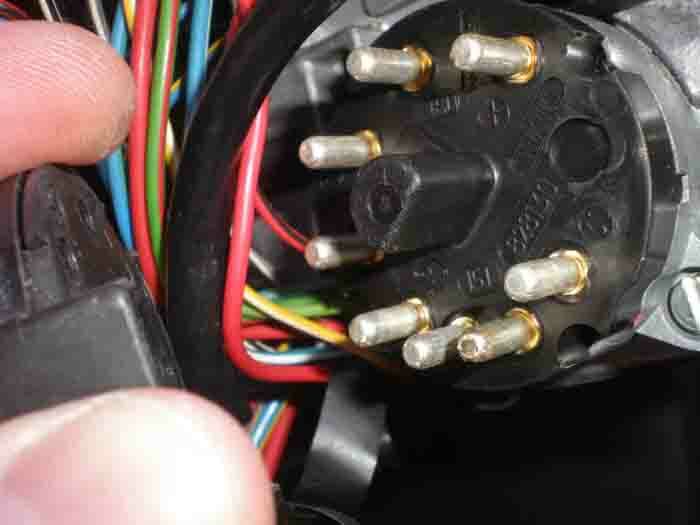 If you decide to keep your Ignition Switch (Electrical Portion), then remove it using Torx #20 key, then transfer it to the new Ignition Tumbler Assembly. Note there are a large and a small notch so it can only be aligned 1 way. However, at 100K, I think it is better to replace both the Ignition Switch (Electrical Portion) and the Ignition Tumbler Assembly. 9. 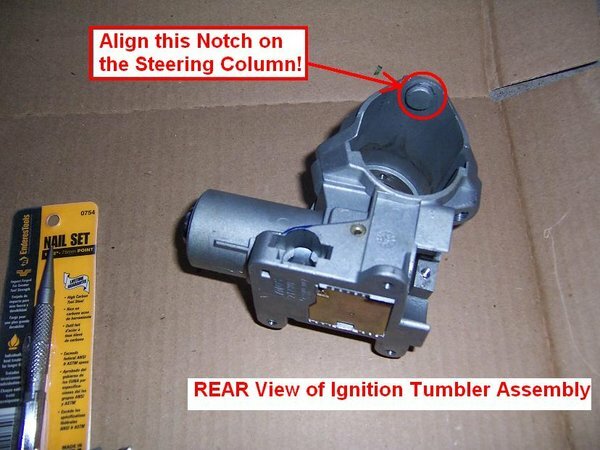 Re-assembly is straightforward, make sure the notch on the Ignition Tumbler Assembly lines up with the Steering Column hole before you tighten the Shear Bolts. Again, I did not snap the heads of the Shear Bolts, just finger-tight and snug. Also make sure the Rubbers around the Turn Signal and Wiper Stalks fit properly on the Upper and Lower Covers. A very special thanks goes to my friend Rob at http://www.volvotips.com/ who helped with priceless advice every step of the way. 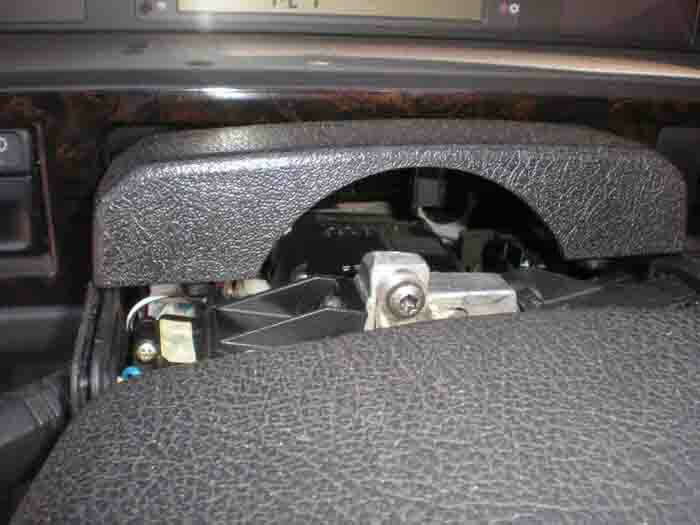 BRIEF: While you may enjoy reading the full story of my searches for repair/replacement of my 1999 Volvo V70 Ignition Switch and/or Key Lock Cylinder Problem with Key Rotating Freely at 360 Degrees, it is more probable that you want to fix your car first. 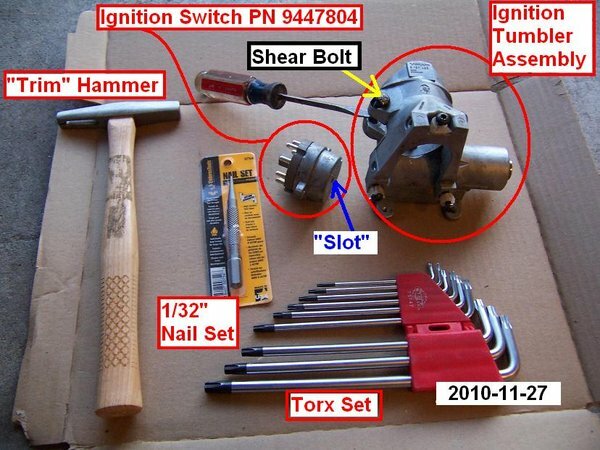 The foremost and cheaper thing to do is check the electric part called the Ignition Switch. 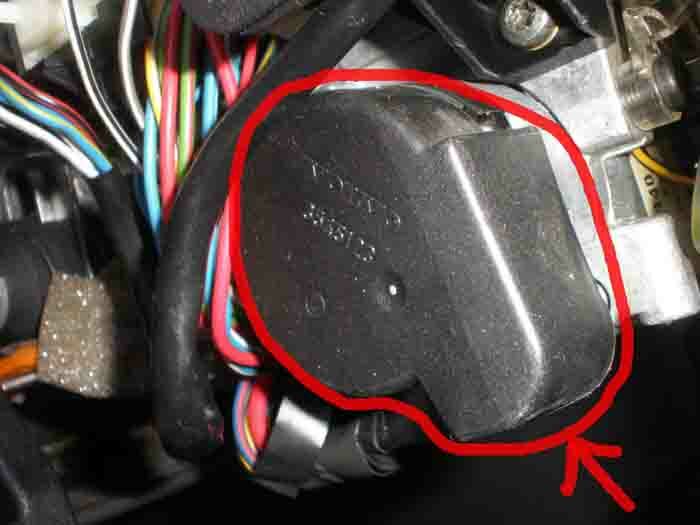 The ignition switch is attached with two screws on the LEFT side of the ignition assembly costs about $60 from either the store or the dealer (dealer probably will only bit around $10 more expensive but it will be a genuine part) and is recommended for replacement every 100,000 miles. IMPORTANT: You can still start the car even if the switch or the ignition cylinder or something in the brackets is broken. 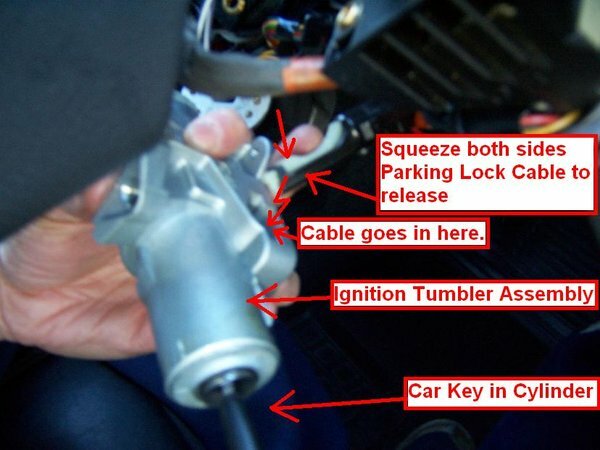 Unscrew the ignition switch and with a key in the ignition, in POSITION II, insert a flat head screwdriver as shown on the picture below. Twist the screwdriver and the car will start. 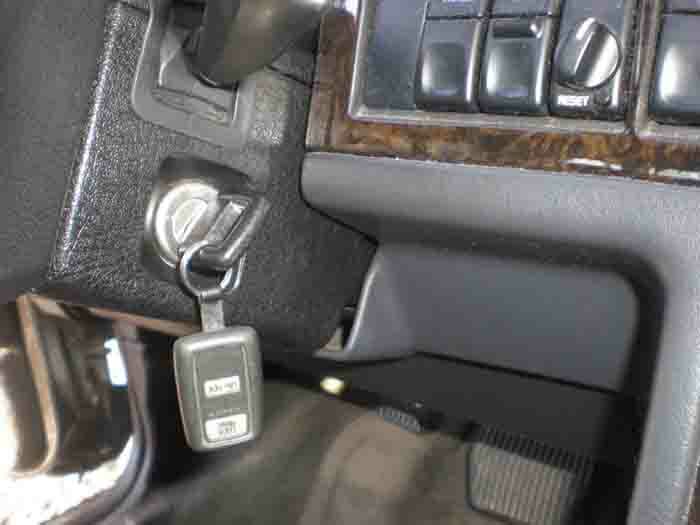 The ignition switch comes in at least two versions in the newer models and with our luck came with both version in the 1999 V70 which could be determined by taking it OFF (not apart if you don’t want to break it) or by calling Volvo with your VIN number. The part is also available by BWD via Advanced Auto Parts and/or Autozone, if you don’t want to wait on the dealer. The part is NOT yet in their online catalogue, but it is found in the printed master catalog. 1999 Volvo with chassis starting from CH587537 take Part. No CS1054, while chassis up to CH587537 take Part. No CS1057. I honestly to this day do not know which one goes on the Volvo with chassis No CH587537 and I do hope that as you are reading this you are realizing this is the chassis number of your Volvo. Anyhow, take the switch out and it will be obvious which one you need. Finally, don’t try to fix this part, as there is not much to fix as you can see on the picture below. Just get a new one and replace it. I tried to fix mine when it was not broken and promptly broke it as a result. Volvo has done a really Mickey Mouse job on this one. If you are seeing this part of your switch in photo below, you have done what you are NOT supposed to and opened the switch. It is very hard to get everything aligned back and re-shut. But of course curiosity kills the cat – but this is a $75.33 learning experience. 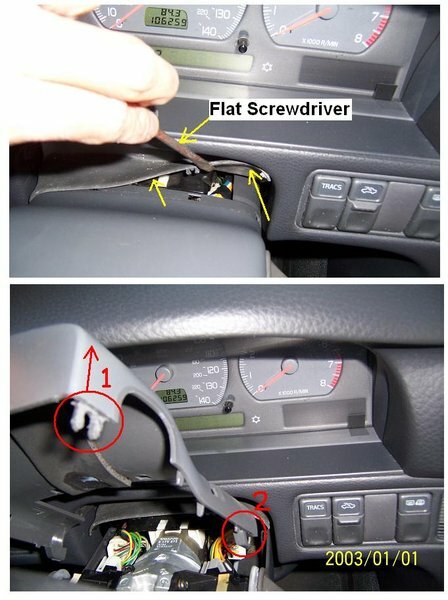 Basically think, if you followed the previous directions and started the car with using a screwdriver, this part works fine. 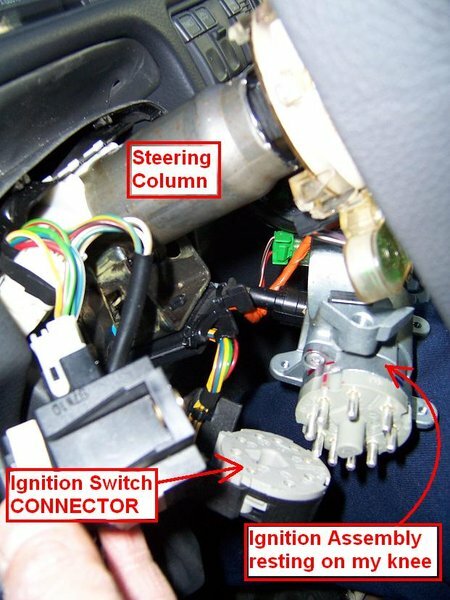 (1) Make sure the problem is NOT in the electric part called the ignition switch, which is attached with two screws on the LEFT side of the ignition assembly or steering wheel. 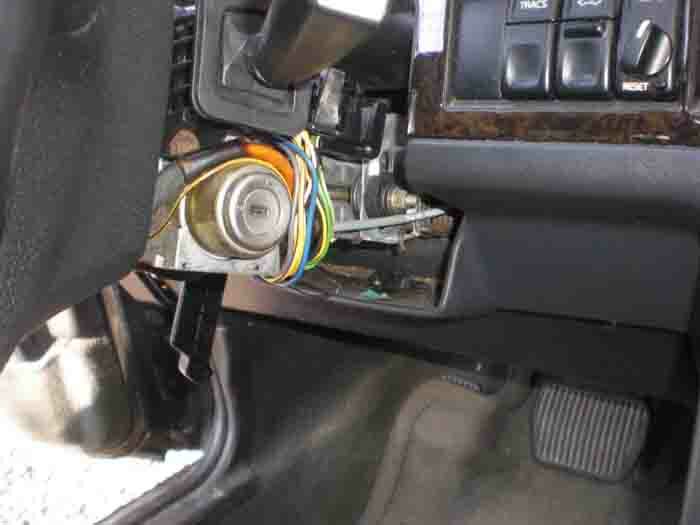 See how here: 1999 Volvo V70 IGNITON SWITCH (Cost: around $60-$75). We ordered our part on Tuesday afternoon and received it promptly on Friday morning via FedEx. 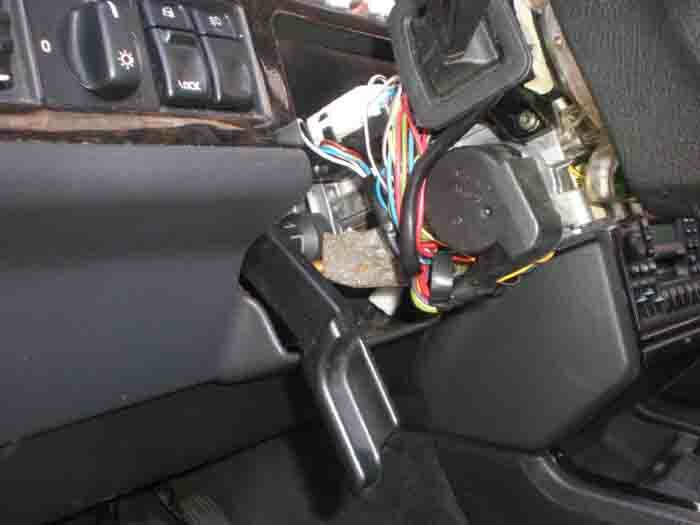 (1) Ignition switch, the electric part located on the left of your steering wheal has gone bad. See how to replace it yourself for around $60 or redneck-fix-it here. 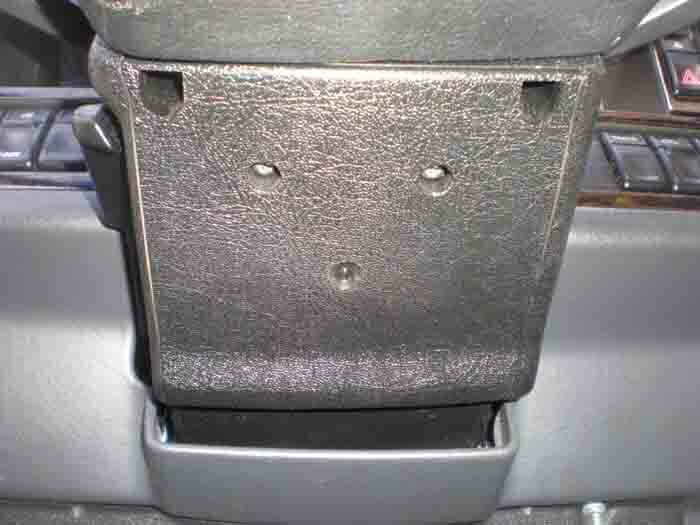 (3) The metal guillotine, which locks your steering wheel or some other metal part within the ignition assembly, has broken. There’s no way for you to take it apart and fix it. 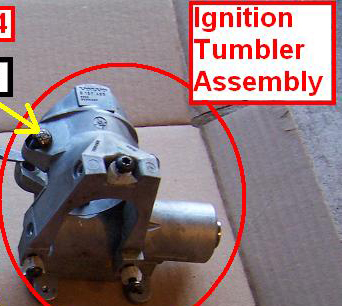 There’s no way for you to take the ignition cylinder out of the assembly. There’s no way to order them separately. They have to be ordered together from Volvo and mounted as described here. In some rare cases, you may be lucky and have all of the above. Anyway, if you have to change the ignition assembly, it’s recommended to change the ignition switch as well. Especially the older ones with the pin prongs sticking out get oxidized and just cleaning them is not always dependable. If you don’t want to waste your time, just drill the two holding bolts out from the top. The top part of the bracket has no treads. It may be difficult to take the top part of the holding bracket without breaking the tiny clear plastic years of the air bag assembly. You can use your old top bracket as it is. When you try to put the cover back together, cut your wheal 90 degrees to the left and then the bottom cover will slide in place very easy. The wholes for the ignition switch have no treads. Just tighten the screws in and they will snug real good with the soft metal inside the wholes. And finally, if it ain’t broken don’t try to fix it! Nalley’s Volvo in Atlanta (800) 671-3174 had surprisingly reasonable prices and a very, very helpful part/service adviser, which no other Volvo dealership seemed to offer. Dayer Volvo of Atlanta (888) 593-3772 gave a quote on parts and repair in the range of $700-900. When I asked for a bit more specific number I was told $840. Seriously? Guess when I’ll go there for a repair – like NEVER. Thumbs down plus BEWARE! Taska Parts was also recommended on some forums as a cheaper alternative. They order from Volvo and quoted me $230 for the ignition cylinder but after calling and asking 3 times I was still not clear if I am getting just the key cylinder or the whole assembly.